Within a comprehensive asbestos management plan, asbestos surveys are often the most important tool in establishing the risks present and enabling those with duties under the Control of Asbestos Regulations 2012 to fulfil them – but to do so efficiently. Whilst the emphasis is always on safety, it’s also important to remember that without evidence a building doesn’t contain asbestos, it must be presumed to do so, which is likely to mean non-asbestos materials are being managed as if they are. This leads to unnecessary effort and costs. Below, you will find a step by step guide outlining the standard practice of an asbestos survey, and what is involved. The first step to completing a successful asbestos survey is to understand which survey is needed. At Franks Portlock we offer the full range of UKAS-accredited asbestos surveys that cover all eventualities. Management surveys – Surveys of this type are normally the first step in establishing whether your premises contain asbestos and establishing a management plan if they do. They will not include damage to the building fabric (other than to remove samples) but will take into account routine maintenance wherever possible. Sometimes, if planned refurbishment works are due, it’s possible to include specific intrusive inspection points to the affected areas. Pre-demolition surveys – This survey is required when demolition work is scheduled at a property. Unlike management surveys, this needs to be a fully intrusive inspection, to check the building fabric for the presence of asbestos. Pre-refurbishment surveys – This survey is used when refurbishment work is planned for a property, like pre-demolition surveys this is an intrusive inspection, however, the scope of the work will depend upon the nature of the planned refurbishment. At the beginning of a survey, although most pertinent information should already be in-hand for large sites, there will be an initial walk-through. This is required to, among other things, identify anything that may obstruct the project, to check the validity of plans and risk assess the site. During the survey, surveyors will work methodically through the premises and use their skill and judgement to identify suspect asbestos materials. They will collect a sample for lab analysis to definitively verify the asbestos content. If necessary, a water absorption test will be completed as a part of this analysis, this is used to ascertain the density of a material and whether it is a cement-based product or a less dense insulating board type material. During surveys, the work areas should be free from anyone but the survey team and for refurbishment or demolitions surveys, the premises should be vacant unless tight controls are in place. Air testing can also feature in an asbestos survey, depending on the investigation’s initial findings. This may be in the form of background testing prior to commencing work, reassurance testing after the discovery of asbestos in poor condition, or personal monitoring to our staff. Reassurance air testing – To test residual fibre concentrations or to ascertain whether airborne fibres are present in a given location after a particular activity. Background testing – Carried out prior to asbestos inspection, remedial or removal works commencing, to ascertain background levels. Personal air testing – Your certified asbestos consultant will advise when this test is necessary, as it can be applied in several instances: to select RPE and ensure it remains adequate for ongoing works, for medical surveillance records, for method risk assessments, and to ensure work control measures are adequate and remain effective throughout. Clearance air testing as part of the four-stage clearance process. An air test is used to detect airborne asbestos particles by drawing in a known volume of air through a filter over a measured period of time. Any airborne particles collected in the filter are then prepared for examination by microscopy. At Franks Portlock, our lab analysis and air testing are fully compliant with the asbestos Health and Safety Guidelines (HSG) 248, accredited under ISO/IEC 17025 by UKAS and in accordance with the Control of Asbestos Regulations 2012. After the survey you will receive a survey report that details all asbestos materials found, along with photographs and recommendations on how to manage the asbestos safely. How can I prepare for an asbestos survey? Occupancy – If the building is in use, contractors cannot conduct intrusive inspections and it might restrict management surveys, so it is important to consider this before scheduling an asbestos survey. Scope of work – It’s very important to fully understand the scope of any works requiring an asbestos survey to ensure that it is comprehensive and relevant to the project. Think about any ancillary work to services that may be needed outside the area subject to the refurbishment or demolition too, new cable runs for example. Access – Ensuring our consultants can get full access to the property will prevent delays and possible further costs which may incur if a return visit is needed. Lack of keys or access codes is the most common issue encountered. Find out more about how you can plan for an asbestos survey here. After the survey is complete. Its important to note that an asbestos management survey is just the first step and you’ll need to act upon any immediate actions raised. The information provided will give you everything you need to go on to create an asbestos management plan, should it be found in your premises, to ensure that it is does not pose a significant risk to occupants, visitors or contractors. As part of the ongoing management, ACMs should be periodically reinspected to check their condition hasn’t deteriorated, or they have become vulnerable to damage. 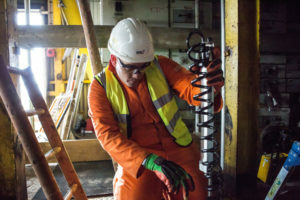 Franks Portlock are more than happy to assist you with all of this, including costings for removal/remediation and carry our air testing and clearance certification. Don’t forget that if future refurbishments are required, a management survey is unlikely to suffice and a project specific refurbishment survey will need to be arranged for a more intrusive inspection. To get in touch with one of the Franks Portlock team to discuss how we can help you with an asbestos survey, call 0191 419 3116 or click here to leave us a message.